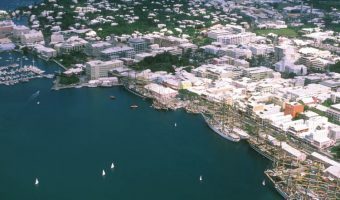 Point Pleasant Park and Albuoy’s Point are situated in Hamilton, behind HSBC Bermuda’s head office. Albuoy’s Point is a dock and the pick-up point for many of Bermuda’s water tour operators and fishing boats. Booze cruises also depart here in the summer months. Point Pleasant Park is a small public park with a grassy lawn, trees, and great views of Hamilton Harbour. There are plenty of benches to sit on and view the activity on the water. There’s a memorial here to the crew of the HMS Jervis Bay and their role in one of the most heroic acts of World War II. When war broke out the British Royal Navy converted the passenger liner Jervis Bay to an armed merchant cruiser. The ship’s main role was to provide protection to convoys of freighters crossing the Atlantic. On November 5 1940 HMS Jervis Bay was escorting a convoy of 37 freighters from Halifax in Nova Scotia to the UK when she was spotted by the German battleship Admiral Scheer. Captain Edward Fegen ordered the convoy to disperse and directed his ship directly into the path of the Admiral Scheer. This selfless act drew the fire of the Germans and gave the convoy time to escape. Hopelessly outgunned, the HMS Jervis was hit repeatedly and sank with great loss of life. Thanks to this heroic act, most of the convoy managed to escape and safely reach the UK. The HMS Jervis had been a frequent caller to Bermuda during the war. The memorial was erected a year after the sinking. On Remembrance Day a service is held here to honour the ship and her crew. Point Pleasant Road leads from Front Street to the park and dock. Here you’ll find the offices of Fantasea Bermuda, the Royal Bermuda Yacht Club, the offices of the Bermuda Chamber of Commerce, and a souvenir shop. There are also public toilets here. Hamilton Ferry Terminal is just east of Albuoy’s Point. All of Bermuda’s ferry services depart from here. Other parks in the area are Barr’s Bay Park and Par-la-Ville Park. Map showing location of Albuoy’s Point and Point Pleasant Park. Video showing ferries at Hamilton Ferry Terminal.